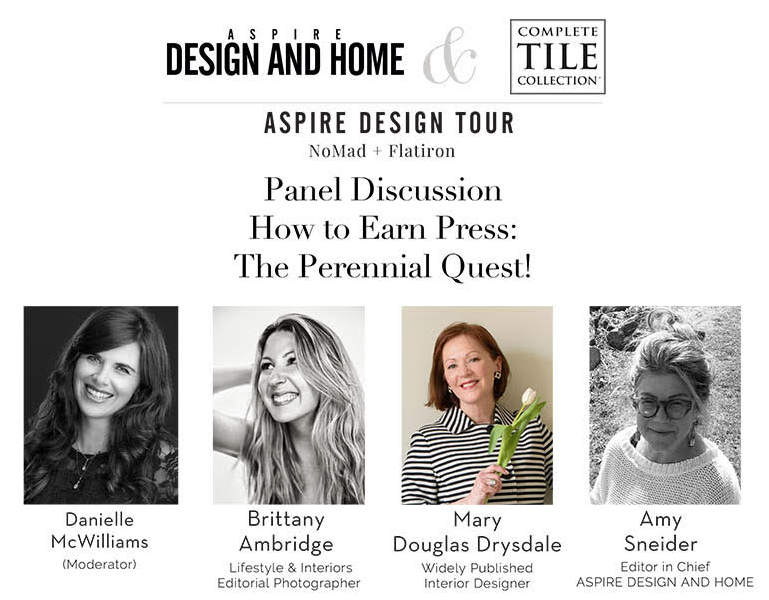 [ASPIRE Design Tour] Panel Discussion: How to Earn Press? How do you get the media to notice your unique talents in a seemingly ceaseless sea of designers? How do you successfully get your message out? Those who are interested in the answers to these questions may want to check out the programming during next week’s ASPIRE Design Tour! 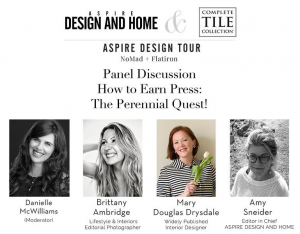 Coming to NYC, August 22-23, ASPIRE Design Tour’s two full days of programming and events will include a panel discussion on “How to earn press” at the Complete Tile Collection on August 23, 2018 (12:30 – 3:00 pm). 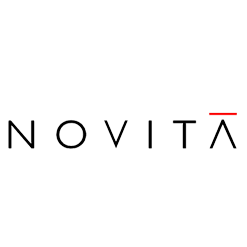 Moderated by the Senior Vice President of Novità Communications, Danielle McWilliams, a lively panel of industry experts will share their insider tips on getting audiences’ favor. Panelists include Lifestyle & Interiors Editorial Photographer, Brittany Ambridge, widely published Interior Designer, Mary Douglas Drysdale, and ASPIRE DESIGN AND HOME Editor in Chief, Amy Sneider. With 14+ years of experience in design public relations, McWilliams has a keen marking insight, strategic communication skills and extensive national and international experience. She serves as the PR Chair of the New York Metro Chapter of ASID. Ambridge’s editorial work has appeared in publications such as The New York Times, Vogue, and Architectural Digest, while her portraiture also captures tastemakers like Eva Chen, Christy Turlington, and fashion designer Rebecca Minkoff. Drysdale’s career and project work have consistently been honored by the design industry. Drysdale’s projects have garnered over 60 career covers both in the US and abroad. She was named 5 years running as one of House Beautiful’s Top 100 of American Design.